PGM Mineralization Continues to be Encountered in Drilling at the at the River Valley Platinum Group Metals Project, Sudbury Mining District, Ontario – New Age Metals Inc. Updated NI 43-101 resource calculation to commence upon the announcement of final assays. River Valley is the Largest Undeveloped Primary PGM resource in Canada, with 3.9Moz PdEq in Measured Plus Indicated including an additional 1.2Moz PdEq in Inferred. November 8th, 2017 Vancouver, Canada – New Age Metals Inc. (TSX.V: NAM; OTCQB: PAWEF; FSE: P7J.F)is pleased to announce the third and final batch of drill hole results from the 2017 drilling campaign. Drilling was focused on the T3 Zone and Pine Zone as a follow up of the 2015 and 2016 drilling and IP geophysical work at the River Valley PGM Deposit. Trevor Richardson, President/COO states “The purpose of the 2017 summer/fall exploration program was to focus on the footwall mineralization. The main River Valley PGM Deposit is a contact-style mineralization and this is where the bulk of the resource has previously been identified. The PGM mineralization found in the footwall is newly discovered mineralization and will add to the overall amount of PGM mineralization. This additional mineralization will be reflected in the new resource calculation/updated 43-101 for the River Valley PGM Deposit”. 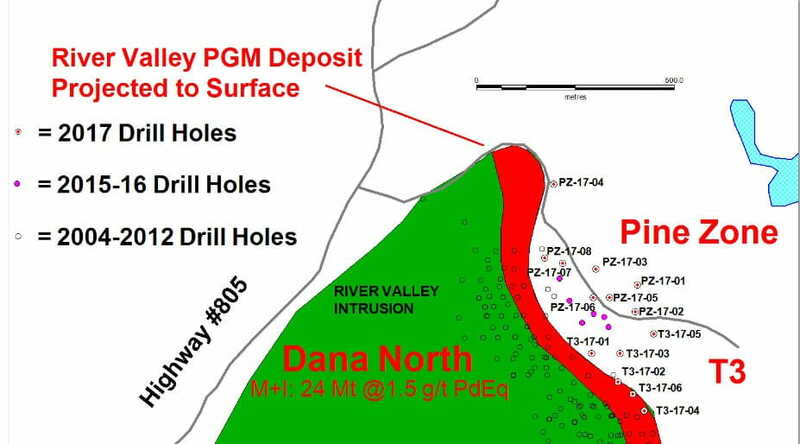 Present drilling into the footwall of the Dana North Zone area of the River Valley PGM Deposit has defined continuous PGM mineralization. To date PGM mineralization has been extended approximately 140 m eastward of the present known PGM mineralization. Past resource calculations of the Dana North Zone have been determined to be 24 million tonnes at 1.5 g/t PdEq. The recent footwall drilling will add to the resource calculation. Hole PZ-17-08 (figure 2) that is being reported in this release was drilled approximately 40 m to the east of the contact mineralization. It yielded 14 metres of 2.01 g/t Pd+Pt+Au and included 4 metres of 2.09 Pd+Pt+Au. Review of the present drilling and past work is ongoing and will be used to generate a program of additional drilling for the T3 and Pine Zone in 2018. The new exploration model of footwall mineralization has yet to be tested further south of T3, between T3 and T9 (figure 1), and these targets equate to a small portion of the overall 16km of strike length of the main zone. These areas of potential PGM mineralization will be the focus of ongoing and future exploration of the deposit area. 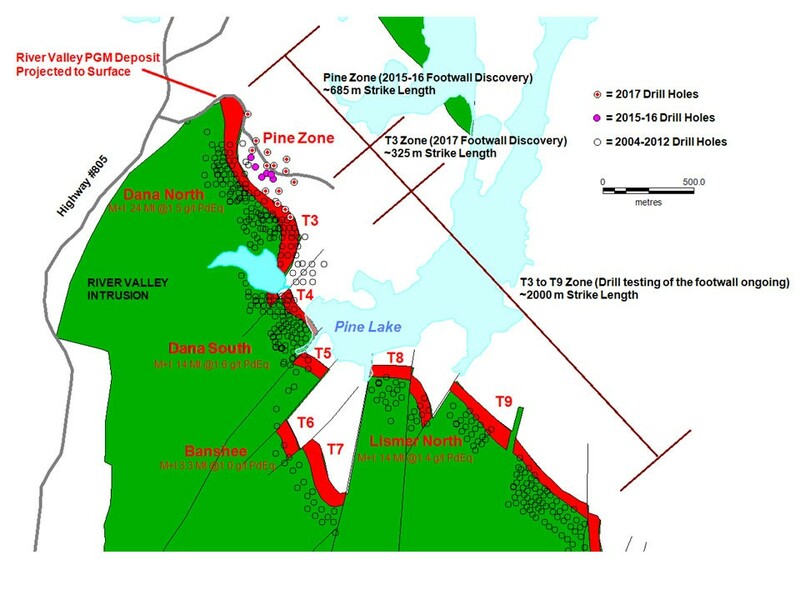 The Pine Zone was the first of numerous newly discovered PGM zones within the district-scale River Valley PGM Project. The Pine Zone is located east of the main River Valley Deposit in an area previously not known for mineralization. The 2016 drill program (figure 2) confirmed the higher-grade, near-surface PGM discovery made in the 2015 drill program (figure 2) and highlighted the continuity of the PGM mineralization into the footwall. The Pine Zone remains open along strike and at depth. Drill results (Table 1) have confirmed continued PGM mineralization in the Pine Zone (footwall) of the main River Valley PGM Deposit. The area from the Pine Zone to T3 equates to approximately ~1000mofstrike length of new mineralization. A total of 15 holes were drilled as part of this drill campaign for a total of 4085m (13,402ft) of drilling. Further re-interpretation of the geology, geophysics, structure and PGM mineralization on the project are ongoing with the company’s geological and geophysical consultants. Drill widths are considered not true width due to the exploratory nature of the drill campaign. The drilling was undertaken by Jacob & Samuel Drilling Ltd. of Sudbury, Ontario under the supervision of a NAM geologist. The drill core samples were sent to the SGS Canada Inc. Laboratory in Lakefield, Ontario for sample preparation and assay analyses. The preparation involved crushing of 3kg of each sample to 90% passing 2mm, and then pulverizing 0.5kg to 85% passing 75µm. Palladium, Platinum and Gold were assayed by fire assay with ICP-AES finish (GE-FAI313). Copper, Nickel and 32 additional metals were assayed by two acid digestion and ICP-OES finish (GE-ICP14B). Blanks and blind certified standard samples were submitted at regular intervals for assay with the core samples as part of NAM’s quality control program. WSP Canada (News Release: Sept 7th, 2017) will be conducting the updated resource calculation and model for the River Valley PGM Deposit. This will incorporate the new findings and interpretations. The company plans to initialize a Preliminary Economic Assessment (PEA) Report in the future with WSP Canada. In-house recommendations will be compiled to delineate future work upon completion of the 2017 field program with future work on Pine Zone, T3, and new un-explored footwall targets. Several 43-101 compliant resource estimates have previously been generated for the deposit through the development phases. The River Valley Deposit present resource, with approximately 3.9 PdEq ounces in Measured Plus Indicated mineral resources and near-surface mineralization covers over 16km of continuous strike length. NAM’sflagship project is its100% owned River Valley PGM Project (NAM Website – River Valley Project) in the Sudbury Mining District of Northern Ontario (100 km east of Sudbury, Ontario). Presently the River Valley Project is Canada’s largest primary undeveloped PGM deposit with Measured + Indicated resources of 91 million tonnes @ 0.58 g/t Palladium, 0.22 g/t Platinum, 0.04 g/t Gold, at a cut-off grade of 0.8 g/t PdEq for 2,463,000 ounces PGM plus Gold. This equates to 3,942,910 PdEq ounces. The River Valley PGM-Copper-Nickel Sulphide mineralized zones remains open to expansion. The company has recently completed a drill program on the Pine and T3 Zones. The Company has five pegmatite hosted Lithium Projects in the Winnipeg River Pegmatite Field, located in SE Manitoba. Three of the projects are drill ready. This Pegmatite Field hosts the world class Tanco Pegmatite that has been mined for Tantalum, Cesium and Spodumene (one of the primary Lithium ore minerals) in varying capacities, since 1969. NAM’s Lithium Projects are strategically situated in this prolific Pegmatite Field.Presently, NAM is the largest mineral claim holder in the Winnipeg River Pegmatite Field and is seeking JV partners to further develop the company’s Li division.